Back when we first reviewed the Wii U hardware, we called the touchscreen GamePad's three to five hours of battery life the system's "Achilles' heel." Nintendo is now taking some action to toughen up that weak heel, in Japan at least, by offering an optional expanded battery pack that extends the GamePad's functional life away from a charging outlet. 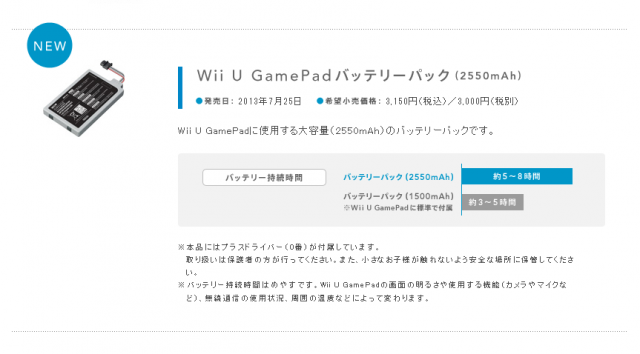 The new battery pack, which will retail for ¥3,150 (about $30) when it hits Japan on July 25, extends the standard battery capacity of 1500 mAh to 2550 mAh, providing what Nintendo says is five to eight hours of juice. The battery is the same physical size as the built-in battery included with the standard Wii U GamePad, and it requires a quick installation with a Phillips head screwdriver. There's no word yet on whether this official expanded battery will be available in the US or other regions or whether an imported Japanese version will work on Wii U GamePads designed for other countries. For those who don't want to wait, Nyko currently offers an internal Wii U PowerPak rated at 4000 mAh and a bulky clip-on external battery extender that claims to double the GamePad's battery life (and doubles as a handy kickstand for the touchscreen). The Tendo Project – Daily Nintendo News is powered by	WordPress 5.0.4 and delivered to you in 2.381 seconds using 41 queries.